The question in the title is rhetorical. Of course anti-racism must play a role! The above took place in September 2015. 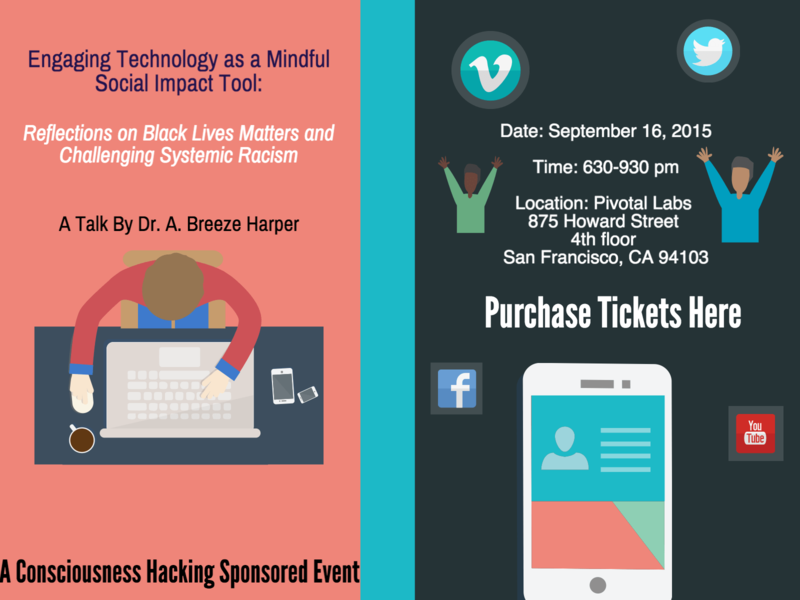 I was asked to speak at Consciousness Hacking series in San Francisco (Ok, after attending 2 and realizing no one was talking about racial privilege/racial caste system, I had myself invited). My talk was called “Mindful Social Impact Tool: Reflections on Black Lives Matters and Challenging Systemic Racism” and it was the first talk ever to bring in systemic racism. I am thankful that Mikey Siegel, the organizer and creator of the series, was open to my suggestion of inviting myself and presenting a topic that is largely ignored by the techie mainstream. There were only a handful of Black folk there in a very packed and popular event that I spoke at. What really struck me (but not surprised, just disappointed), is that while walking to get to the event (in San Francisco), from where I parked my car, there were about 10 homeless people along the way. All of them were Black. When we arrived to Pivotal Labs, where the event was hosted, I wondered about gentrification, “new white flight“, and to what extent mindfulness and technology works, if it’s in the mostly privileged San Francisco/Silicon Valley bubbles. I wish I had said the above, but because of the space, I decided that it may come off as not sounding like I appreciate the comment, and therefore, wasn’t being mindful… (I did learn later that the person who asked the question was raised in Germany. I thought, “Interesting, I’ve been to Germany quite a bit and there is anti-Black racism there, along with xenophobia against African/Black folk. It may operate differently, but it is still racism.” So, let me just say that I’m always blown away by people who have never studied critical studies of race in the USA, never took a training or workshop do understand systemic racism in the the USA, but can confidently tell me that I basically don’t know what I am talking about. The above has happened all to frequently when I speak about systemic racism and even unconscious bias in general, and not just in the sphere of technology. What I do regret about my talk is not being more assertive and not having more self-esteem to respond with what I just wrote in the former 2 paragraphs. I had really sanitized the presentation and my responses to the audience– and perhaps even supporting white fragility with my emphasis on trying to use mindful language as not to hurt the feelings of those white people who have spent most of their time in that protected privileged bubble. The speaker who came after me (there were two of us speaking that evening) was a venture capitalist. Noteworthy is that whenever I give a talk, I talk about my social locations and explain how they obviously influence my actions/consciousness (i.e., when I said I’m a Black woman in the USA, so experiencing racism oriented me towards the anti-racism I have been doing for 20 years). The VC, who was a white a man, did not mention his social locations at all (I’d argue that most white men are not socialized to think about naming it). I found this lack of locating one’s social identities, to be the very obvious white elephant in the room– and no one commented about it– Yea, I should have, but I thought I was probably already pushing my luck after already having given my talk. One of the most mindful actions a speaker can take is to name their social locations as well as articulate how unconscious bias (from those social locations) shaped and continue to shape their consciousness around technology and mindfulness– whether it is intentional or not (because it’s all about impact of ignorances arounds unconscious bias as well as as systemic racism). I’m also interested in what would happened if there were conversation about how most VCs in the Silicon Valley area are white men and they usually invest in people who look just like them (often due to unconscious bias as well). I’ve been thinking a lot about the future of activism, technology, and mindfulness/ahimsa. I gave two talks over the last 3 weeks at two universities to really talk about the consequences of creating a ‘future’ of technology and/or food when it’s from the Jetsons mind-frame (i.e., that cartoon showed the future and everyone was white, straight, able-bodied, upper middle class). Will the future of mindfulness and technology, in the San Francisco Bay Area, be as white, heteronormative, classist, ableist, etc, as the Jetsons were? Below is the poster I created for the event. “Social locations” – I haven’t heard it phrased that way before, I like that way of putting it. As an openly queer non-binary person (in addition to being black), I must either disclose my identity or remain invisible and inauthentic. Too often in public I choose the invisible route just to get through the day. But online I am getting much more vocal about all facets of my identity. That was a great talk Breeze! That one guy (during the Q&A segment) who called you “narrow-minded” was a bit off-putting. Black Americans don’t need to speak about all black folks around the globe when we talk about race. Dr. Brittney Cooper once spoke about the ways that black folks aren’t ever allowed to be specific. We always have to talk about everyone else because it makes folks uncomfortable when we speak about our own experiences. Also, I think it’s discursively violent to assume that Black Americans can speak to ALL black and brown experiences throughout the globe. Veganism is contextual and so is blackness. I was once at a conference speaking about black feminism and veganism in the U.S. south and this one black Caribbean lady stated that dietary practices are different in the Caribbean and I should have included that in my analysis. I’m like–no—there’s absolutely nothing wrong with speaking about my experiences in the U.S. considering that’s my experience. We need to stop acting as though brown and black folks in other regions can’t speak for themselves and need Americans to do it for them..it’s basically objectifying them. We can’t flatten-out all black and brown experiences. Context matters and our analyses deserve nuance and specificity. You did a great job handling that question.